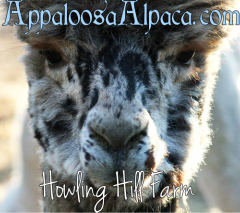 Howling Hill Farm is proud to own a variety of harlequin appaloosa alpaca herdsires of the highest quality and of varied bloodlines. The majority of our harlequin appaloosa herdsires are closed to outside breedings; however, we also offer a variety of quality﻿ females for sale ﻿bred to our studs at very competitive prices. Logan is a young classic harlequin grandson of My Peruvian Obsydian. His fleece is extremely dense and very fine, with an amazing uniformity of color that is unseen in dark tuxedo greys. Logan has a wonderful disposition and beautiful style. "Parker" is a harlequin son of one of the most unique-looking harlequins in existance: Whispering Winds Showtime. He is ideal in size and breed type, with a stunning head and square, blocky build. His fleece is fine and bright with a wonderful handle. Scottie is a masculine, powerful appaloosa herdsire. His genetics trace back to Magnifico. His tenth fleece was magnificent: dense and bright, with beautiful crimp. He had a very successful show career with numerous first-place ribbons (he was shown prior to multi color championships). Read more about Scottie on his homepage. Kubota is a spectacular appaloosa with elite fleece. Both his sire and dam are fleece color champions, and Kubota's fleece has taken high scoring first-place ribbons at every show it has been entered into. Read more about Bota on his homepage.